What's New | Manhattan Scientifics Inc.
(April 30, 2018) To listen to the replay of the investor call of June 16, 2017 concerning the Imagion IPO, please follow the link below. (June 19, 2017) To listen to the replay of the investor call of June 16, 2017 concerning the Imagion IPO, please follow the link below. (December 7, 2016) The effort is focused on overhead conductors to reduce line losses in power transmission and distribution. Reprinted courtesy of Wire Journal International. (April 28, 2016) Nanoscale magnets offer a new way to find faint, early traces of cancer in patients, according to Rice University students working on a method to capitalize on the magnets’ properties. 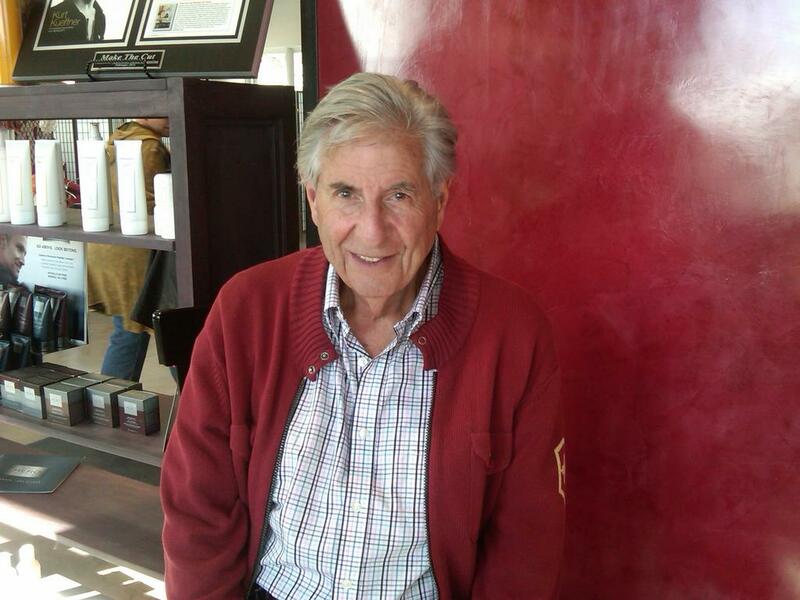 (September 2, 2015) Marvin Maslow may not be as well-known as investors George Soros, Michael Milken or David Bonderman. But one thing he has in common with those marquee names is his goal of bringing experimental cancer-fighting technology to market. Maslow is the founder and current chairman of Manhattan Scientifics Inc., a New York City company headquartered in the Chrysler Building and trading under the ticker MHTX. The company, a technology incubator that develops medical devices, currently finds itself in growth mode, trading on the OTC Venture Market and not at all shaken by the recent goings-on in the stock market. (July 17, 2015) Pursuing his new and very personal interest in the latest cancer treatments and technologies, Texas blogger and book author Al Petter recently wrote about his opportunity to get a behind-the-scenes look at what is happening at MD Anderson in advanced cancer research. We were surprised and delighted to learn that Mr. Petter was given a personal tour of the Magnetic Relaxometry Lab by Kelsey Mathieu, a lead investigator in our collaboration. 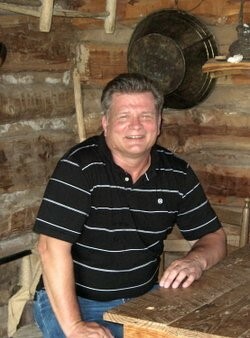 Mr. Petter wrote a detailed account of his visit on his blog, "Texas Thru My Back Door." There, Mr. Petter also revealed that his fiancée, Suzanne, is a breast cancer patient and clinical trial participant at MD Anderson. "Suzanne and I were so impressed by the promise of this new technology, we wanted to help out," wrote Mr. Petter. And so they did. These generous and forward-thinking Texans have establis hed the "Suzanne's Cancer Adventure" GoFundMe campaign to raise funds for magnetic relaxometry research at the MD Anderson Cancer Center. 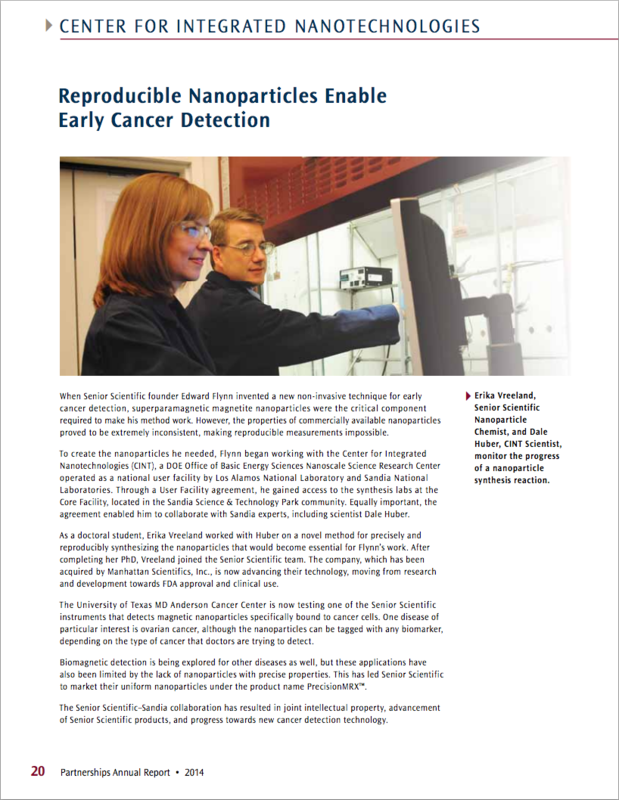 Read Nanotechnology at MD Anderson Cancer Center at Texas Thru My Back Door. (June 26, 2015) In a newly released publication, Magnetic Relaxometry has been demonstrated to be more than 100 times more sensitive than previously reported. The optimized method can detect, localize, and quantify cancer cells with sensitivity and precision greatly exceeding alternative methods such as mammography and ultrasound imaging, making it an ideal platform for the in vivo detection of solid tumors. (June 25, 2015) The New Nano Particle Lab at our Albuquerque facility is almost complete. Click below to see a few photos of the lab. (May 3, 2015) Cancer continues to be one of the leading causes of mortality globally. Despite technical advances in science and medicine made in the last 150 years we still lack effective forms of therapy for many types of cancer, and the general consensus within the medical community is that more lives could be saved if cancer could be detected earlier. (March 27, 2015) In the report they highlight the CINT/Senior Scientific collaboration efforts. A feature is available on page 20 of the report. It can be viewed by clicking here. Read the entire partnerships report (PDF - 40 Pages). Senior Scientific is pleased to announce two new employees have joined Senior Scientific LLC. Kayla Minser, M.S.,has joined our team as Biomedical Research Associate. Ms. Minser holds an M.S. in Biological Sciences from Purdue University, where she studied the mechanisms of breast cancer metastasis and methods by which to inhibit metastatic spread in vitro and in vivo. She will be supporting ongoing biological studies using functionalized nanoparticles in cell and animal models. Andrew Gomez, M.S. has joined our team as a Process Development Engineer and lab manager. Mr. Gomez will soon receive his M.S. in Biomedical Engineering from the University of New Mexico, where he has been studying biologically inspired nanomaterials for drug delivery and monitoring in vivo. He will support nanoparticle production efforts for both commercial and internal R&D use. (November 4, 2014) We are happy to report that Dr. Flynn is quoted in the article, "Take a Nano Pill and Call Google in the Morning?" published by TechNewsWorld. The article includes quotes from many prestigious researchers such as those at Quinnipiac University, Baruch College and the American Institute for Behavioral Research and Technology, so Dr. Flynn is positioned as an industry thought leader among stellar company! Take a Nano Pill and Call Google in the Morning? 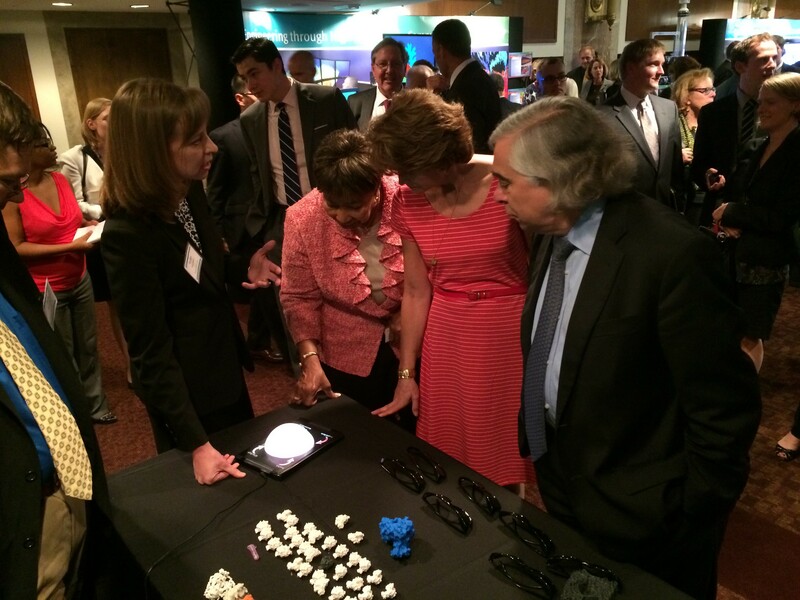 (September 26, 2014) Chief Nanoparticle Chemist at Senior Scientific Dr. Erika Vreeland, presented our nanoparticle work at the National Lab Day in Washington: “How the National Labs Keep Moving America Forward”. 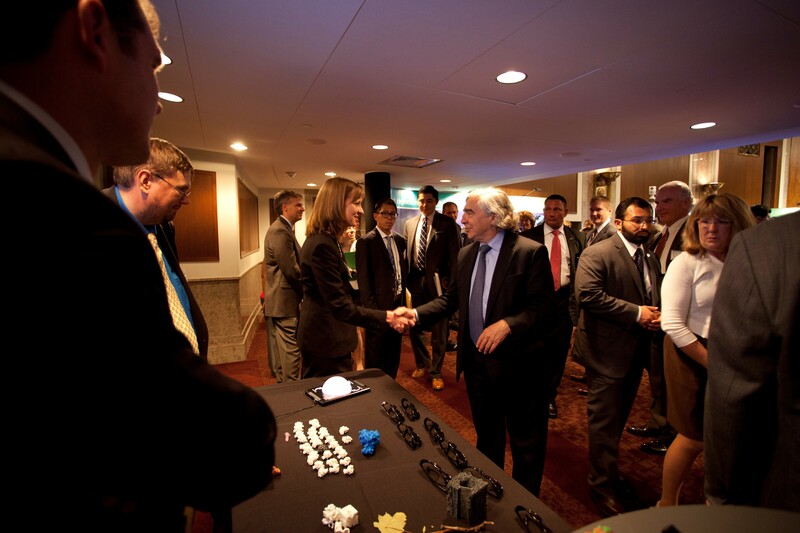 She met and spoke with United States Secretary of Energy, Dr. Ernest Moniz. To view images from the event, follow these links. 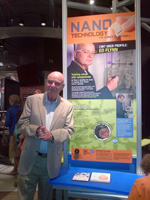 (June 12, 2014) This film was created by a film crew from the Los Alamos Laboratory to be part of the ongoing exhibit on nanotechnology at the Bradbury museum in Los Alamos for the Center for Integrative Nanotechnologies (CINT). It consists of interviews with Dr. Dale Huber and Edward R. Flynn which are partially overlaid visually by ongoing experiments and experimental results. The beginning of the film consists of some of the early history of Dr. Flynn’s experience in biomagnetism which began the 90’s. Also shown is a large SQUID sensor for measuring magnetic fields from the brain using 155 SQUID sensors, along with some measurements of fields from the brain. The historical content is followed by showing our own Leyma DeHaro recording data that is being taken on cancer cells using the magnetic relaxometry instrument and this is followed by the showing of confocal images of cancer cells. The film also includes the analysis procedure for these cancer cells, showing the extraction of magnetic field contour lines from the data and the method the analysis code uses for multiple magnetic sources. In addition, Senior Scientific’s Erika Vreeland is shown with the apparatus for making the magnetic nanoparticles at CINT and some of the results characterizing these nanoparticles including TEM images and size analysis. (June 11, 2014) The MRX II is up and running at MD Anderson! At the heart of the instrument are the multiple SQUID detectors working together to detect a signal from the bound nanoparticles in a sample. Based on the first generation system created by Ed Flynn himslef, the MRX II instrument includes new hardware and electronics to provide even better performance and seviceability in the field. The system, now in operation at MD Anderson, includes computer controlled mechanical stage movements , precisely milled platforms for sample positioning, and an integrated optical imaging capability, not to mention a professional exterior to match the high quality performance. (April 14, 2014) Building upon local relationships, Senior Scientific is stepping into the commercial space with first product introductions through Azano Biotech. Azano currently supplies research reagents to the same cancer researchers who will eventually be customers for the MRX II instrument. Therefore, we are pleased to be making the PrecisionMRX Nanopartticles available for them to use is assays and applications that they will eventually want to quantify using our instrumentation. Azano is set up to take orders, package and distribute, as well as leverage existing relationships in the research community to whom we can introduce Precision MRX Nanoparticles. (March 19, 2014) The overarching mission for February has been to get the 9 Channel System up and running. We are delighted to be delivering this extraordinary device to our collaborators at MD Anderson. The full article can be found in the PDF version of this document. Please click below to view the file. Senior Scientific is pleased to announce two new employees have joined our team. (December 11, 2013) Leyma De Haro, Ph.D., has joined Senior Scientific LLC as our Biomedical Applications Scientist. Ms. De Haro has a PhD in Biomedical Sciences from the University of New Mexico, and was most recently a Postdoctoral Research Scientist in the Bioscience Division of Los Alamos National Laboratories. She will be working with protocols for bioconjugation, in vitro assays, and preclinical in vivo measurements. She will be developing new applications inside Senior Scientific, and working in support of our initial external users. Todor Karaulanov, Ph.D., has joined Senior Scientific LLC as our Chief Instrumentation Physicist. Mr. Karaulanov has a Ph.D. in Physics from the Bulgarian Academy of Sciences in Sofia, Bulgaria, and has worked as a Postdoctoral Scientist at Los Alamos National Laboratories and at the Univ. of California, Berkeley. He will be working all aspects of our instruments, including the present preclinical instruments and extensions to other platforms and clinical applications. (October 1, 2013) Manhattan Scientifics, Inc. (the “Company”) closed the second tranche of financing in the amount of $500,000.The Company is on schedule with the instrument assembly and prove-ins set forth in the financing agreement. (August 1, 2013) Magnetic relaxometry methods have been shown to be very sensitive in detecting cancer cells and other targeted diseases. Superconducting Quantum Interference Device (SQUID) sensors are one of the primary sensor systems used in this methodology because of their high sensitivity with demonstrated capabilities of detecting fewer than 100,000 magnetically-labeled cancer cells. The emerging technology of atomic magnetometers (AM) represents a new detection method for magnetic relaxometry with high sensitivity and without the requirement for cryogens. We report here on a study of magnetic relaxometry using both AM and SQUID sensors to detect cancer cells that are coated with superparamagnetic nanoparticles through antibody targeting. The AM studies conform closely to SQUID sensor results in the measurement of the magnetic decay characteristics following a magnetization pulse. The AM and SQUID sensor data are well described theoretically for superparamagnetic particles bound to cells and the results can be used to determine the number of cells in a cell culture or tumor. The observed fields and magnetic moments of cancer cells are linear with the number of cells over a very large range. The AM sensor demonstrates very high sensitivity for detecting magnetically labeled cells does not require cryogenic cooling and is relatively inexpensive. (July 29, 2013) On July 26th 2013, the Los Alamos National Laboratory's Bradbury Science Museum opened a new exhibit on nanotechnology research, which featured, Senior Scientific and Dr. Edward R. Flynn’s work in early detection of cancer utilizing nanotechnology.